If you ever find yourself in need of a voice changer, you’re going to have a real problem as there are a lot of applications out there. Although you’re probably thinking that there can’t be a big difference between them (they all change your voice right?) it’s not that easy and you’ll see why. On top of that you can download an app no matter if you’re using an android phone, an iPhone or a desktop, so there are a lot of possibilities. We’ll show you the best software you can download on each platform. This is one of the simplest software you can find and it’s very straightforward. When you first launch it, you’ll get a “doctor” on screen that will help you optimize your microphone and your volume levels – although you have the option to skip that, we recommend doing it because it will help you; without that we had some problems adjusting the volume. You have 3 effects by default – Man, Tiny Folks and Woman. The man effect is cool, it thickens your voice and makes you sound like a 40-year old man that’s holding an important speech, but the other 2 effects are pretty much useless. The tiny folks is funny and you can use it with your friends but it doesn’t do a very good job and neither does the woman effect. Maybe these effects will have better results for women because they have a higher pitch. The interface is pretty easy to use although it looks like the 90s winamp. The best news is that it also has a paid version, the MorphVOX Pro, which comes with a new interface! 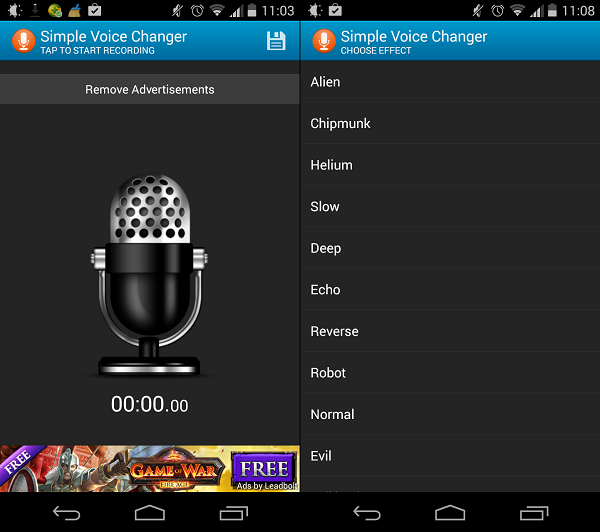 Besides that, it will add voice effects, backgrounds and voice changing algorithms. This looks more complicated than MorphVOX but don’t worry, it’s not that hard to use it. The cool part is that once you start talking it has an equalizer that it will adjust itself to your voice and the noise in the room. 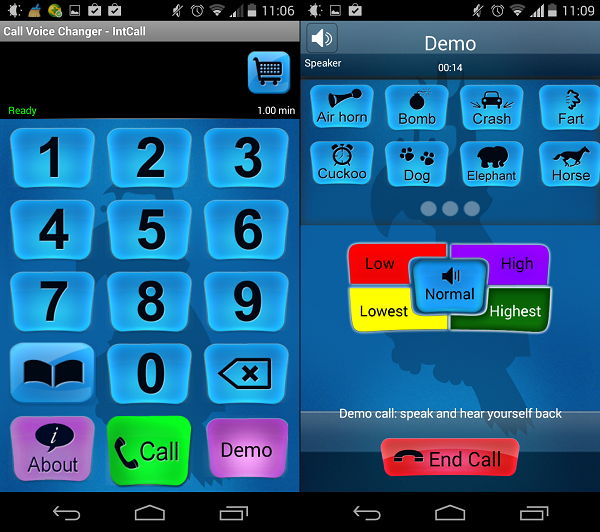 It has a lot of buttons but unfortunately most of them are not available in the free version. 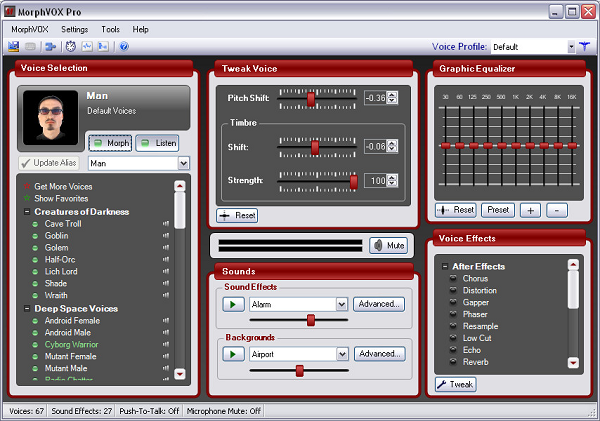 It has only 2 effects available, one for male voices and one for female voices – this feature would be useful in MorphVOX. 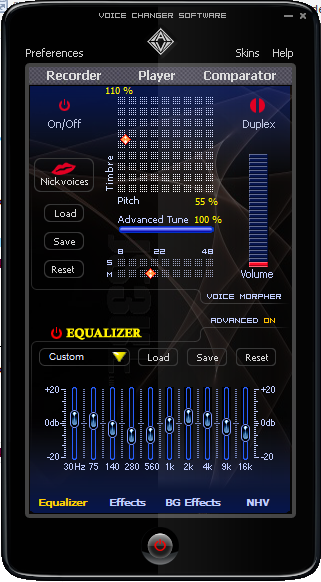 You can find more effects under the equalizer section – you have 4 different options so you can lose the equalizer. The interface is pretty nice, it looks a lot like an ipad so you shouldn’t have any problems navigating. It also has a Diamond Edition, that comes with extra features: you can use all the effects, all the nickvoices and it adds new skins. This is a software that’s simple and complex at the same time. 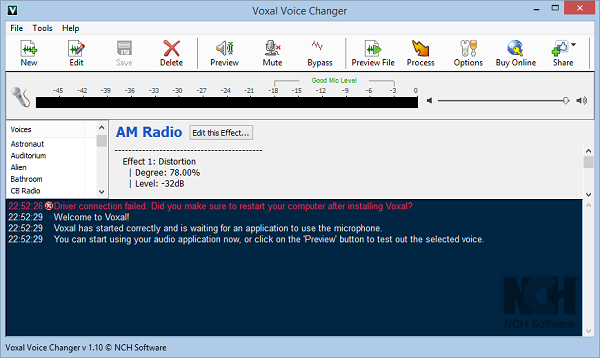 The interface is extremely simple (it looks like the voice recorder from Windows) – on the left you have all the categories and once you click on them you’ll see the effects available. Some categories have only one effect, others have as many as 4 so there’s a wide range of possibilities for you. The best part about Voxal is that you can edit every effect so you can tune each one of them to fit your voice. There aren’t too many buttons available so there aren’t a lot of distractions – you can stay focused on what you’re doing in order to get the best results possible. Just like the others, it has a paid version also, if you need more effects and features. To be honest, I don’t think the premium version is necessary, since the free version is more than enough. 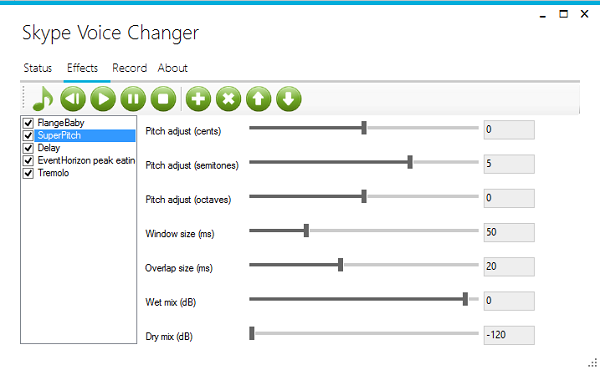 A voice changer specially developed for Skype. 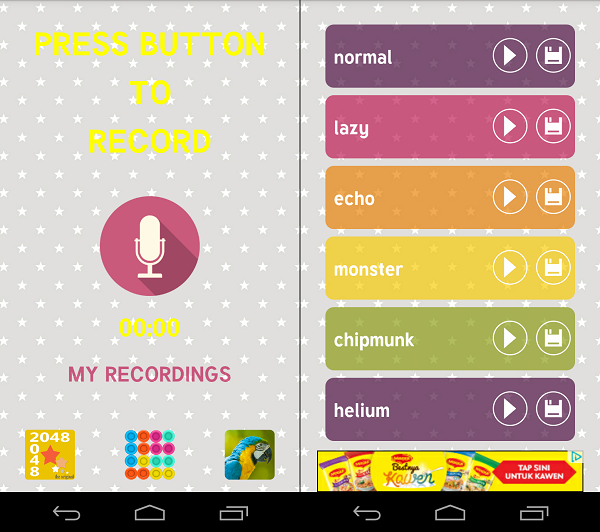 6 fun voice effects are provided, where you can easily add one by pressing the “+” button. You can play with: the pitch, where you have 3 options called cents, semitones and octaves; windows size; overlap size; wet mix and dry mix. You probably never heard of these but once you start changing the figures there you’ll see what each of them does and you can adjust them to create the perfect voice for you. This is the best example of how to create a simple app – you don’t have to do all at once, you take it one step at a time. First you have a screen where you record what you want to edit and only on the next screen you get the effects. This helps you focus first on the recording and second on the effects. You can choose one of the 12 effects, which range from women to helium and robot, save the recording and even set it as your ringtone, which is an interesting feature. It also gives you the possibility to share it with your friends, which also is a good thing to have as everything is social nowadays. As the name says, this app is mainly for kids and you notice that as soon as you see the first print screen in Google Play. The background, the buttons, the colors, everything yells kids, which is not that bad since the other apps are general, are not designed specifically for a certain age or gender. We have to admit that it looks quite nice, it has 12 effects which is enough and it also gives you the option to share your recordings on social media networks. I don’t think you could want more for your kid which will probably spend hours having fun with this. Although it’s not the best looking app available, you can do your job with it. You have 24 sounds effects which can be applied while having a call and it also gives you the option to change the volume – a feature that other apps don’t have but, to be honest, we find it pretty much useless. And the problems don’t end here. When you launch the app it says you receive 2 minutes free of charge but for the rest you’ll have to pay. Unfortunately this app doesn’t use the provider to make the calls, you have to buy minutes within the app in order to call your friends and have some fun with the sound effects. We find that difficult, especially because all the other apps are either free or can use the provider to make the calls so you don’t have to pay anything extra. This is one funny app! We used the Lite perform to test it and we still had plenty of fun with it even though it has only 6 effects available: chipmunk, fast, slow, reverse, normal and synthesizer. Unlike the software for desktop, you can’t really use this to change your voice while playing games or talking on skype. This is something you can use on a night out with your friends when you don’t have anything else to do. It will take up plenty of your time because it will be fun when you have your friends around, you’ll come up with all kinds of quotes. All you have to do is record a quote once and apply different effects on it. If you really like it you can get the paid version, which will remove the ads and give you the other 15 effects. We think it’s worth it since the 6 effects available in the Lite version are very nice and probably so are the others. 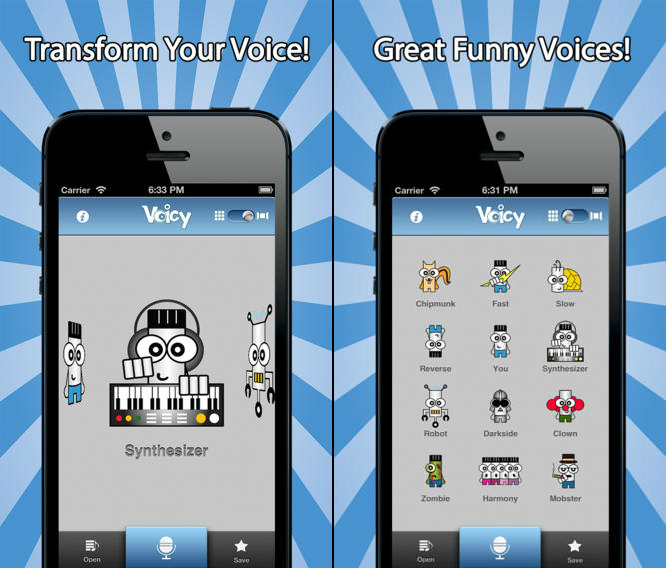 This app is identical with its Android version, where they both have similar features and interface. It also has 24 effects and you get 2 minutes free call at the beginning. A cool app to prank call your friends, but you must be willing to pay for extra minutes after you’ve exceeded the free quota limit. 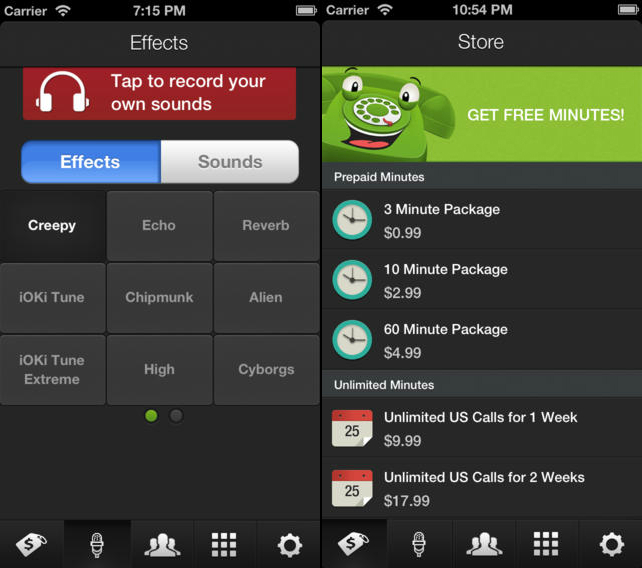 Apart from changing your voice during live call, you can pre-record sounds and use them in voice calls. Also, you can easily hide your identity when prank calling, as it you can show different number when calling your friends or family. Similar to Call Voice Changer, you have to buy prepaid minutes before you can start prank calling. If you like our posts, you should give our email list a try. We'll only send you 2-4 emails a month. We hate spam as much as you do! I have a fun time with AV Voice Changer Software. But if you are a pro, I suggest you to do it with AV Voice Changer Diamond edition. Try it by yourself.